I am not sure when or how it happened, but some time after becoming a book blogger, I stopped being a book browser. I would go to the library and the bookstore and book fairs and Amazon armed with a wish list and look for specific authors and titles that I have been wanting for months. And I would feel so thrilled to get a book that I wanted - it was like a treasure hunt and I was always shocked to find that a book so high up on my wish list was, for some unknown reason, not high up on anyone else's, and it felt so wonderful to find a book waiting for me like a gift. But somewhere along the way, I forgot about the pleasure of walking slowly down a library aisle, looking at so many titles of books, pulling one down from the shelf, and deciding that it was one I wanted to take home with me. I forgot about opening up a book I know nothing about and realizing that I can get just as immersed in that one as I can in all those other books that my friends keep telling me to read. I forgot about how calming it can be to go into a bookstore without an agenda, just open to finding something that appeals to you. I forgot that I found one of my absolute favorite authors - Georgette Heyer herself - by browsing the shelves of a library and picking a book that I thought I'd like. Most of the books and authors I love - The Book Thief, Terry Pratchett, the Marcus Didius Falco series, Diana Wynne Jones - have been recommended to me by other people. But some of them I found on my own, just by meandering down the aisles and reading book jackets. I didn't realize until recently just how much I miss that feeling. This year, I very firmly set no reading goals for myself, but decided to just read what I wanted to read, when I wanted to read it. And I did. So instead of forcing myself to read only from my bookshelf (which would be a very worthy goal, I admit), I allowed myself to read what I wanted from my shelf and supplement it with other books. I went to the University of Michigan's browsing collection in the Undergrad library and read my first Jo Walton book. I looked through Project Gutenberg's offerings and found a hidden gem no one I knew had ever read. I availed myself of the Chicago Public Library's extensive audiobook download collection and listened to a story I have had on my radar for a while but never had the motivation to read. I went to the book store and discovered a fun and entertaining comic series that I'd never heard of before. The result is one of my most varied and successful reading years in memory. No, I haven't loved every book that I've read, but I've loved the flexibility that I gave myself to read what I want. I love going to the library and just wandering around until something jumps out at me. I love ignoring my TBR list, and picking books by authors that I enjoy but whose books weren't necessarily at the top of my list. I don't need to read only the book that I want the MOST, I can read the book that I want RIGHT NOW. It seems simple, but it's not. With so much choice, and so many recommendations, and so little time, we can so easily put ourselves on a schedule or force ourselves to follow rules that don't always make us happy. If there is one thing about book blogging that I regret, it's this loss of spontaneity - there's always the thought at the back of your mind about how quickly you can review a book or how recently you reviewed another like it or how likely your followers are to be interested in one book vs. the other option. But the joy of reading exists not only in the act of reading itself - it is there in the anticipation you feel when you go to a bookstore, the affinity you feel when you are introduced to the main character, the thrill you feel when you realize that a book is really, really good. The excitement of finding a book that no one else in your circle has ever encountered before. And, for me, much of that joy has come about through browsing shelves and websites and catalogs that I haven't for a very long time, welcoming authors and characters and books to my life that would otherwise have consistently been de-prioritized in my reading queue. Because now I know Miles Vorkosigan, have met Terry Pratchett's Dodger, understand much more the court cases leading up to Brown vs. Board of Education, and why so many people love Dorothy Sayers. And I don't know if I'd ever have given them the benefit of the doubt if I didn't allow myself the freedom to leave my wish list and TBR list at home once in a while. Do you still treat yourself to aimless browsing? What books have you discovered this way? It is hard to find that joyful spontaneity sometimes. I do really like to have a reading plan, and I had lists even before I started blogging, but I'm much happier if I leave some room for reading by whim. I've cut way back on review copies (and may give up on them entirely) because I like having that space. The thing that's changed for me about browsing is that because I blogging I rarely feel like I'm "discovering" a book when I browse. I'm just so much more aware of what's out there that's there not a lot of space for surprises. Bookstores are the worst for me because they tend to prominently display the same books that are being talked about all over. Libraries and used bookstores are a little better, but even there what's more likely is that through browsing I'll be reminded of a book I've been wanting to read. But that's nice, too, because sometimes I'll decide now is the time and take it home. You make a good point, Teresa. For example, many of the books I've read from the library are ones that were already on my radar or that I saw and jogged my memory about something I heard or read before. So you're right- not necessarily my OWN discoveries, but books that I probably wouldn't have picked up at right that moment if I hadn't been browsing and open to finding something new. I absolutely love wandering through the library shelves. I usually limit myself to the new book section, but there is nothing like reading through descriptions and picking a book just because it sounds interesting. I have tried to ensure from the start that book blogging doesn't stop me from reading whatever I want to read. That can be hard at times, especially when I'm reading slowly, but for the most part I think I've managed to stick by my guns. And I most definitely haven't stopped browsing. You're right that it is a real thrill to wander a library or bookshop and just pick out books at random. Even if I stop myself from buying/borrowing any I love the browsing itself. Yes, that's a good point, too. Even if you don't actually pick a book up, that doesn't mean there's no pleasure in just looking through them. I think I get a lot of pleasure doing that in the non-fiction sections because those are separated in pretty detailed ways. Fiction can be overwhelming sometimes because it's all in the same section - but I guess that's where you can find some magic! I still book browse (though usually at bookstores rather than libraries). But I try not to buy books unless I've read reviews. I'm not always successful though! I can't remember the last time I've treated myself to aimless browsing. Part of it has to do with the pressures of book blogging while another part has to do with having the kids and other family members around with me. I'm glad you're loving your year of reading. I LOVE browsing through a library without a list or agenda and walking out with a pile of books. I spent many happy hours, as a child, doing that, and I haven't done it in a long time. Excellent post, Aarti! I haven't done that in sometime, as when I go to my library's online catalouge, I am usually looking for something specific. I think it's important to keep some randomness in your reading. When I go to the bookstore nowadays I do go generally with a particular book in mind, but I'll let myself wander around once I've found it because I remember doing so before blogging and how much I enjoyed the books found by doing it. You can have goals and TBR lists, but reading only from that does take some of the magic out of reading. After reading a lot of review copies one after the other I decided that for every review copy I must read a book of my own choosing. You are so right, Aarti. For a while I would run into my library and grab the books I had on hold, feeling pressured to read from my TBR list and for my "challenges". Lately I've been spending time in the stacks, and loving it. I tried to be a more spontaneous reader in 2012 and hope to be even more so next year. Thanks for a wonderful post. I don't do much aimless browsing, but I really need to! I got a good feeling just reading your post, and think that although I have about a thousand books here, and I see books everyday that I want, I need to just go to the book store and browse for a little bit. I bet that would do my heart wonders. Loved this post Aarti. You've inspired me! I had the same feeling earlier this year and have stopped rushing to put every book I see mentioned on blogs on hold at the library. The return to aimless browsing there and in secondhand book shops has led to some wonderful discoveries, particularly older books which had previously slipped past me unnoticed. I've never been big with the aimless browsing. I do it occasionally, but usually my serendipitous reading comes about because I'm looking for one thing, can't find it, and happen upon something else instead. I never ever did that thing you describe of strolling down library shelves and seeing what caught my eye -- it sounds nice! I just get frustrated too quickly for that to be any use to me. It's awesome though that you're giving yourself space to browse the way you like to! It sounds really satisfying. Aw, I love this post. I miss that kind of spontaneity too. I think that up until 2010 or so I was good at maintaining it even though I was a blogger, but in recent years I've been a bit less adventurous in my reading. Perhaps it's time for that to change. I'm happy to hear you've been having such a satisfying reading year! I agree; this is not the first time I've pondered the adverse effects of blogging on 'reading'. But that was when I only read 12 books a year as my goal and I didn't have any cool people to talk books with. I am happy that you have had such a successful year of personal reading. I will think most hard on this in January when I review my year but I can already admit that this took a path I never expected and that is how many big chunksters I tackled! I used to hate big books and now I am wondering why and what exactly happened! This is such a great post. I'm guilty of the same treasure hunting mentality. I make big wish lists and forget to just try new things. Thanks for the reminder. Enjoyed reading this post and all the comments. There's so much buzz about so many books so far in advance that I feel behind on reading books that have just come out or haven't even come out yet, so that has definitely affected my browsing habits. Reading book blogs does feel like browsing in a way, though, and allows for that serendipity (going from link to link); it's just mental rather than physical! Yes, you are right. I've allowed blogging to replace the time I once spent perusing books. Thank you for this reminder to focus on the activities I love. What a great post. I love to browse but don't have much time for it anymore. And I really miss it. Yes, yes, yes! I've been thinking about this myself, too, but more in the context of browsing bookshops and the catalogues of indie publishers, rather than in libraries, where I haven't lost the art of browsing in the same way. I originally discovered Penelope Fitzgerald by browsing and finding a copy of The Bookshop (of course I had to look). I also discovered Bronwen Wallace by browsing (the first short story writer who truly excited me by making stories of such ordinary events and feelings and putting female characters at the heart of it all). And there are others too: thanks for reminding me of them! This is such a good post about a feeling I have all the time. I used to browse for books a lot, and just seem to have gotten out of that habit as my own personal unread shelves have filled up with books. 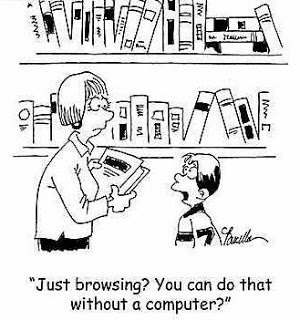 I still try to browse at the library when I have time to wander around, but don't end up reading as many of those "browsed" books as I wish I did. I look at reading book blogs as a sort of browsing. How long have you had a book blog? I ask because this post sounds like one I would have written say year three to five of my own book blogging experience. I used to be much more in-tune with what everyone was reading and with finding books I could finish in a few days so I'd still be able to post two reviews a week. While I still think about my blog when choosing books to read, I'm much more likely to read what I want to and let the posts fall where they may.